What should disqualify someone from being a saint? That might seem a funny question. How about sin? But over the course of the last month, people in California and elsewhere have been asking it a lot. In January, Pope Francis announced that in September he will canonize Junípero Serra, the 18th-century Spanish Franciscan priest whose network of missions formed the basis both for Christian evangelization and Spanish colonization of the region. But Serra was also a missionary of his time. The diary of his first trip north is rich with affection for Native peoples. But fundamentally he was not interested in Native cultures; he was not there to “go in their door” but to help them leave all that behind. “To become a Christian was to become a European,” explains Robert Senkewicz, a professor of history at Santa Clara University and the author of the new book Junípero Serra: California, Indians, and the Transformation of a Missionary. Once baptized, Native peoples were forced to live on the mission property—building, farming and learning to live as Spaniards. Few Native Americans understood going in that baptism was an “irrevocable commitment,” says Senkewicz. Many came to the missions not out of any religious motivation but because the livestock brought by the Spanish had destroyed the plants the tribes relied on for food. The missions were their only means of survival. Today, “Rarely do you find a California Native person with a [Native] name like Eagle,” says Ron Andrade, a member of the La Jolla Tribe, who is executive director of the Los Angeles City/County Native American Indian Commission. Their names, like their cultures, were largely erased. Even for modern Native people who support Serra’s canonization, like Andrew Galvan of the Ohlone Tribe, who is the curator of Mission Dolores in San Francisco, the current relationship between Native peoples and the church leaves much to be desired. “Most Native peoples have stories where we’ve been blocked out of the missions,” forced to pay to get into the missions their ancestors built and then not consulted on how their history is represented by mission curators. To measure Serra’s actions by 21st-century standards would be unfair. And his motives were the best: that the people might know Jesus. Yet shouldn’t the facts to which Andrade, Senkewicz, Galvan and others point also give us pause? What does it say to canonize today someone whose life’s work ended up extinguishing whole communities (with the advent of European disease) and even cultures? Along highways 101, 82 and 1, small replicas of mission bells hang from poles shaped like shepherd’s crooks, marking the 600 miles the Franciscans traveled to build and support Serra’s network of 21 missions. In the end, perhaps Serra’s canonization is meant to be for us like the ringing of those bells, a reminder, yes, but also important for the sorts of things it causes to resonate within. Our parochial school 4th grade history book in the 1940s devoted an entire chapter to Junipero Serra. We learned that Junipero planned to found enough missions to form a rosary, each Hail Mary named after a saint: hence, Santa Barbara, San Francisco, etc. He fits the definition of a saint as a sinner who tries. A wise novice master once told his neophytes that we become saints, not because we're good; but because we change. Let's pray that Junipero changed. What is canonization for ? Examples for others ? There are too many saints, and a lot of saints are unknow. 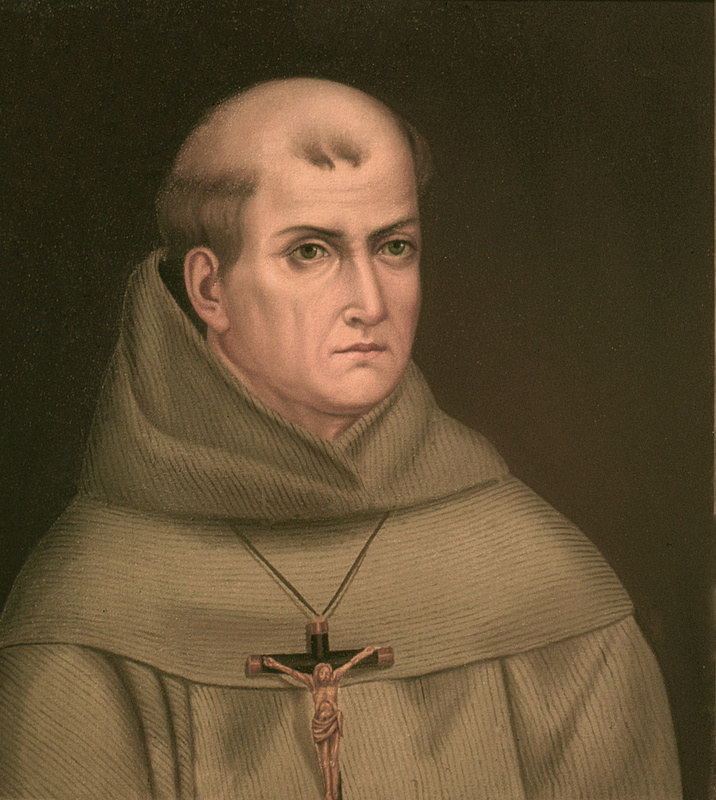 For example, I did know anything about the life of Father Junipero Serra: There are multiple versions of his life. I am not a historian and therefore unable to avaluate them. I read the life relationship of some other American saints that I had chosen as models. I wanted to organize my life like that of RP Rutilo Grande sj or Archbishop Oscar Romero. I read their life project and how they were murdered. They both were killed by death squads because they wanted to apply the law of Christ to the poors. I must say that a martyr role scared me a little. I often pray both Saints, asking them to intercede for me, to make me as brave as they were. I was more interested in other saints of the American Continents, including a French Jesuit, Father Ignatius Chomé. Ignatius Chomé evangelized Chiquitanie (Bolivia) including three Reductions: San Ignacio de Zamucos, San Xavier and Concepcion. In addition, he was a linguist. A profession that has two important qualities for a missionary. The first is to place him in direct and constant contact with the people. The second was to allow him to teach local languages other missionaries, so they should get the opportunity to communicate directly with the Amerindians and evangelize them. When the king of Spain expelled the Jesuits out of his colonies, father Chomé was 72. He died of exhaustion during a forced march to reach the ocean and return to Europe. I think his life is a good example of Christian life . My saints are not part of the official list: This text is a mere attempt to show how to develop such an "official" list. This attempt would be based more on the aspirations of the Christian people as the political dreams of some bureaucrats: the actual way to make saints indeed seems quite mysterious to many of us . This article also appeared in print, under the headline "A Controversial Canonization ," in the March 9, 2015 issue.